How do You Deal With a Paralyzed Dog? Having a paralyzed dog is often a difficult and heartbreaking experience especially when your canine companion, indeed your best friend, has been with you for many years. But you don’t have to put your faithful friend to sleep. While euthanasia used to be the standard course of action in the case of paralyzed dogs there is now a much better solution. If your dog is healthy except for the paralysis, there are options open to your pet and you. One such option is using a dog wheelchair. Best Friend Mobility dog wheelchairs are customizable to each pet and are sold at affordable prices. Designed by a veterinary orthopedic surgeon, Dr. William Vachon, a Best Friend Mobility dog wheelchair can help your dog resume its active life and provide you with more wonderful years of companionship. 1. Ask our experts on staff for more information about using a dog wheelchair. Our knowledgeable staff can help to answer any questions that you may have, or guide you in the process of selecting the wheelchair for your paralyzed dog. Remember, your vet can also help your dog get the hang of using a dog wheelchair. A vet can also suggest modifications that will be helpful to your dog’s recovery and comfort. Ask Dr. Vachon (designer of the BFM Dog Wheelchairs), and he will personally answer your questions by email. 2. Work with your dog on therapy. Physical therapy for paralyzed dogs is walking and playing in a dog wheelchair and this rehabilitation can help your dogs health on so many levels. 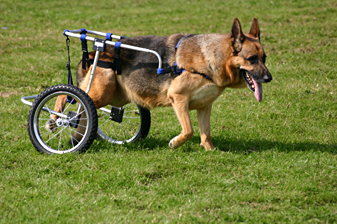 A dog wheelchair will also keep your paralyzed dog active and help him or her to regain a sense of worth and dignity. Certain spinal injuries and neurological problems can improve with physical therapy exercise in a dog wheelchair. 3. Use doggie diapers at first. A Best Friend Mobility dog wheelchair will allow your dog to do normal doggie functions while strapped in. But, while your dog is still getting used to its wheelchair, have it use a doggie diaper. This will minimize accidents for you to clean up. 4. Play and work with your dog.A paralyzed dog looks forward to playing and engaging in activities with its you as much as a non-paralyzed dog would. A dog wheelchair can let your dog play with you, fetch the paper, and patrol your hedge as it normally does. 5. Shower your paralyzed dog with love. Sometimes paralyzed dogs have psychological issues just like a parlayzed human would. They go through the grieving process of losing the ability to use their hind legs and need encouragement and love. Love can work wonders on your dog. Guide him or her in his/her first steps in the new dog wheelchair. See our video with an older paralyzed dog taking her first steps in a Best Friend Mobility dog wheelchair. Shower him or her with affection, give praise, and reward it with treats. For dog wheelchairs user manuals, click here.